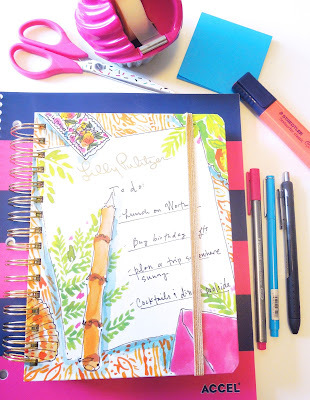 Sew Cute: College Series: School Supplies I CAN'T Live Without! College Series: School Supplies I CAN'T Live Without! School supplies and stationery are kind of my thing. So, back to school time means all new notebooks, pens (lots of pens), planners, and more! Here is my list of must have school supplies that I can't survive college without! Pens- I mean this is kind of obvious, but pens are my life line. When I'm taking notes in class I always use pens and colored pens. My personal pet peeve is when people use pencil to take notes, not sure why it just bothers me! Some of my favorite pens are the Ink Joy gel pen (I use the black ones), Le Pen felt tip style pens (they come in a ton of colors! ), Sharpie pens, and Stadler felt tip pens. I'm a huge fan of felt tip pens because they write super smooth and they don't bleed to bad. Fair warning the Ink Joy pens do bleed, but they write very smooth! Notebooks- In class I always write my notes in a notebook. Freshman year I tried the whole typing on my laptop thing and I got way to distracted. In other words I would be browsing on Pinterest, shopping, working on my blog, etc. So, I converted to taking notes in a notebook. I get all of my notebooks at Staples. They look like the Five Star brand but they are staples generic version but I personally think they are better! I've never had one of these fall apart on me which is super important! Highlighters- I color code and add color to my notes on a daily basis. Highlighters combined with colored pens is a great way to stay organized and to make your notes look pretty! Planners- This isn't a new phenomenon that I'm obsessed with planners. But, my top favorites are The Simplified Planner, The Happy Planner, or my Band.o agenda. Be on the lookout for more planner posts soon! Notepads or paper pads- Making lists is a way of life in my book. I love having small little notebooks or paper pads to jot down quick reminders. If your on a budget the Target dollar spot has a ton of cute weekly notepads or normal sticky notes for just $1 or $3! If you want to splurge Rifle Paper Co. is the way to go! What are school supplies that you can't live without? Let me know in the comments!